Animals also have attributes that you can increase. This page will explain the various product-producing animals you can raise on your farm. Your farm comes with a small Barn and a small Coop. There are different styles of barns available at Ludus' shop, but they are just cosmetically different; they all hold animals and there's no advantage of selecting one type of style over another. A simple Barn or Coop can hold one animal and a Large Barn or Large Coop can hold up to four animals. Purchasing animals can be done at Animal Instinct in Westown or Rural Outfitters in Tsuyukusa. Lulukoko does not sell any animals. The animal's Size will be its profile picture. The longer you own the animal, the larger it will appear to be. The Affection is the animal's friendship with you. More friendship means a higher Star Rank for its products. A Stress bar will reflect how strained your animal is. Spending time outside will reduce the stress. High stress results in sickness, and uncured sickness results in death. The animal's Health will say if it is sick or happy. Sick animals can be cured by using animal Medicine from the animal shop vendors. You can get more items by increasing the Byproduct Amount. The most this can be is 20 products. The Byproduct Level is the chance that plus-quality (+) products will appear. This is gauged from rank E then to D, C, B, A, and lastly rank S.
The animal's Coat is also is ranked from E to S.
The Birthday is the day you bought the animal or the day it is born if you were breeding. A personality Type gives you a bonus to one of five animal attributes. The number of Festival wins is counted. There's no benefit to winning a certain number of festivals. 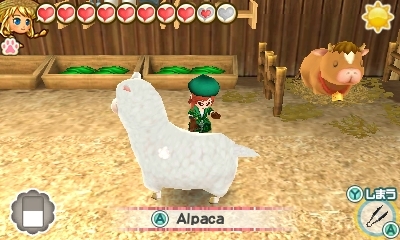 The animal can be in one of three areas on your Farm. Since you can have multiple barns, the specific Barn your animal lives in is also here. 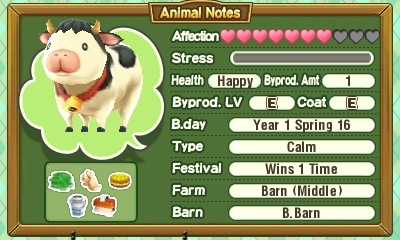 You can move the animal to another barn by pressing the A Button when viewing the animal's profile in the Animal Notebook. The icons under your animal's portrait displays how you've interacted with the animal that day. You can see if it has eaten yet, if you have talked or picked it up, if you have fed it a treat, if you have collected its product, and if you have brushed it. The chickens won't have a brush icon. There are five personality types an animal can have. The type is randomly set on the animal when you open the animal vendor's inventory. If you're trying to get an animal with a specific type and you don't see it for sale, simply exit out of the animal inventory (you don't have to completely exit the shop) and then access it again to get another randomly set type on the animals for sale. Your livestock animals will eat Fodder, which you can grow by planting Grass Seed on your farm. Rabbits eat Rabbit Feed, and all poultry eat Chicken Feed. You can place up to 7 pieces of food into an animal's feed bin inside the barn, which they will eat 1 piece of food every morning at 7:00. Animal feed can be purchased from the animal shops in Westown and Tsuyukusa. Once you build a Feed Maker Farm Circle from Ludus, you can also make it on your farm; though, it is faster to buy it than make it. The animal Feed Maker Farm Circle is used to obtain Deluxe feed that raises byproduct level, as this special feed isn't sold in either shop. There's also Spicy feed that increases coat quality, and Sweet feed that increases byproduct amount. If you can't afford animal feed, you can simply let your animals graze while they're outside. It will take about 2 hours of outdoor time for the animals to be fed, but they won't get the benefits of the special feeds that will impact their attributes. Once all of your attributes are at max level, then outdoor grazing will be fine. On rainy days when the animals stay indoors, make sure you have food in their feed bins. You have to carry the animal food around with you or keep it in your farm house storage until you have a Silo Farm Circle constructed. The Silo requires 10 Brick, 10 Lumber, and 5000 G to construct. Once placed on the farm space, you can hold your fodder, feeds, Pet Food, and animal treats inside of the Silo. Any animal fooder or feed stored in this Farm Circle can be accessed by using the feed Dispenser on the back wall of each barn. Both the Milker and Clippers can be bought at the animal vendors and upgraded at Ludus' shop. The tool's weight will affect your stamina amount when you use the tool, and the tool's effectiveness makes the tool faster. To get plus-quality goods you have to increase the Byproduct Level of your animals. This level increases by feeding it Crispy Treats. There is a Deluxe food you can feed that will also help to increase Byproduct Level, but you have to make it yourself by using the Feed Maker Farm Circle. Animals can have offspring only if you have them in a large barn; the small barns can hold only one animal, but the large barn can hold up to four and includes a place for a pregnant animal to hang out until it serves up a little one. You will need to have the space in your large barn for the baby animal and the momma. To impregnate a cow, jersey cow, sheep, suffolk sheep, alpaca, brown alpaca, rabbit, or gray rabbit, talk to the animal shop vendors and select the Breed Animals option. 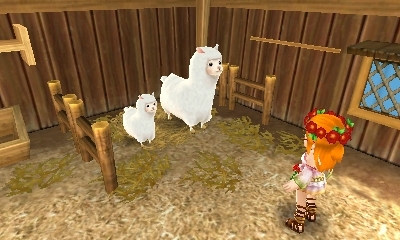 The llama and buffalo cannot be bred. For poultry, all you've to do is pick the bird up and place the bird into the nesting box within the Large Poultry Barn. 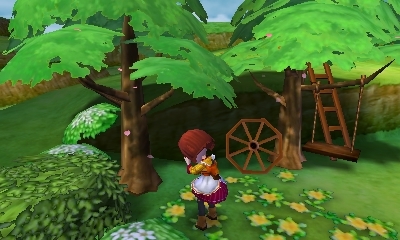 Typically you would place an egg into a nest to hatch, but in this version of Story of Seasons you physically place the mamma bird instead. It takes 21 days for a livestock animal or rabbit to give birth to a younger version of itself, and 7 days for a bird to hatch a chick. The baby animal will take on the same personality type as its mother as well as half of mom's affection hearts. It takes a long time for the little animal to grow into an adult. A baby animal needs to be fed in order to grow, so skipping a day of feeding will keep the baby as a little one for another day. Livestock animals require at least 40 days of feeding before they grow up. Chickens and rabbits take at least 32 days of feeding. Yikes! It may be more efficient to buy your poultry instead of waiting for hatched chicks to mature. Your animals can die from becoming neglected or from simple old age. When a death occurs you'll discover it when you walk into the animal's barn. You'll simply notice that perhaps one of your animals weren't herded out of its barn that day, and walking into the barn will trigger a scene where you realize that your animal friend is no longer alive. Your farm pets and horse cannot die. For animals who are sick, looking at their profile in your Animal Notebook may reveal that the animal's stress bar is completely full. You may also notice a skull icon appearing above its head. You can correct this situation with Medicine from the animal shop vendors for 500 G each. It's a good idea to have some Medicine in your farm house Storage just in case an animal gets sick and you can't make it to the vendor. If you don't heal a sick animal, after some time it will pass away from neglect. Silkies and quails will die after being sick for 3 days, regular chickens will die after 4 days, alpacas and suffolk die after 5 days, rabbits and normal sheep after 6 days, jersey cows after 7 days, normal cows after 8 days, and finally buffalo and llama after 9 days of being sick. Even if you take excellent care of your animals, at some point they will be too old to carry on. Rabbits, chickens, and sheep can start passing away at age 4 or older; Silkies, quails, cows, alpaca, and suffolk at age 5 or older; llama at age 6; and buffalo and jersey at age 7. The better the care the animals receive, the longer they can live. The longest an animal can live is around 8 years old.